For suction cleaning with the P1 dust-free sanding system, the Big Boy, Big Boy Junior and the Floor Sander. 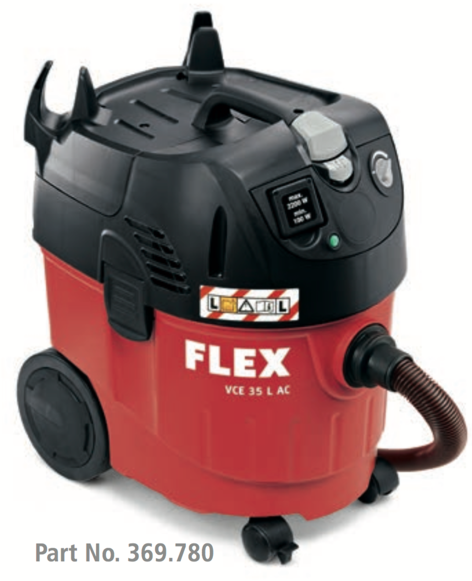 Easy handling and extremely high suction capacity. Safety vacuum cleaner with automatic lter cleaning, 34 l , class L. Delivery incl. anti-static suction hose, Ø 32 mm x 4 m with snap coupling and connection sleeve for vacuum cleaner, universal adapter, 1 at-fold lter, 1 lter bag, paper disposal bag.